A pinched nerve, otherwise called entrapment neuropathy or nerve compression syndrome, is a common term used to describe the injury to a nerve or set of nerves. While it can occur in any part of the spine, it is most common in the neck and lower back. It is a common problem for the upper extremities, partly because to their high mobility, accounting for over 80% of all cases of the pinched nerve. A pinched nerve usually occurs near joints as the nerve passes through fibrous tunnels in its course through the body. Carpal Tunnel Syndrome (CTS) is the most common entrapment neuropathy in humans and is due to compression of the median nerve in the wrist. A pinched nerve can lead to loss of function, and if a chronic condition is present then this loss may be irreversible. Early treatment is, therefore crucial to prevent further damage. This condition may be caused by inflammation or pressure being applied on the nerve root. 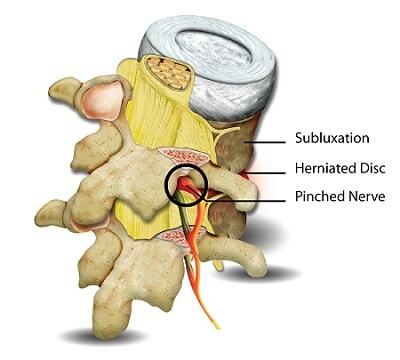 Some nerves are at increased risk of injury due to their anatomical location. Injury to the nerves is common in collision sports such as football, hockey, and wrestling. In football, incidence rate can be as high as 49%. Nerve located close to the surface of the body. Injury to the nerve should be considered for patients that experience pain, weakness, tingling or prickling that is not related to the bone, the soft tissues such as muscles, or the vascular system such as blood vessels. The area where the symptoms occur, the type of symptoms and how they affect activity should be taken into consideration. The intensity of the symptoms may be gradual or acute. The physical examination of a pinched nerve must first make sure that there is no obvious damage to the vascular system that travels alongside the nerves. This is done by checking the radial pulse, which is typically done at the wrist, and also checking for sensation and movements in the fingers. Once this is confirmed, and based on the patient’s history, the rest of the physical examination should involve inspection, palpation, range of motion of the joints, muscle strength testing, neurologic and sensory examination. Plain radiology can be used for differential diagnosis, to eliminate other possible pathologies that would present similar symptoms to a pinched nerve. Magnetic Resonance Imaging (MRI) may only be useful for certain nerve injuries and a normal MRI should not be used to rule out a nerve injury. Nerve conduction tests, which assess the integrity of motor and sensory nerves, can be helpful in confirming a nerve injury diagnosis. Electromyography (EMG), which measures the electrical activity of a muscle, can also be used to detect denervation or nerve damage. Typically, first line treatment for a pinched nerve is non-invasive, with rest and protection of the injured area being top priority. Associated joints should be kept mobile, and strengthening exercises for supporting muscles should be encouraged. If the cause is known, then it should be removed, for example, a bangle, watch or bracelet if the pinched nerve is in the forearm/wrist. While anti-inflammatory medications are usually added to the treatment regime, their effect in the healing of a pinched nerve is unknown. There may be short-term benefits from the administration of corticosteroidal injections or oral corticosteroids. Local injection has not been shown to relieve symptoms for more than one month, however, and a second injection is not known to be effective. Ultrasound, splinting and yoga may have short-term benefits for Carpal Tunnel Syndrome. Literature has indicated that vitamin B6, diuretics, ergonomic keyboards and non-steroidal anti-inflammatory drugs (NSAIDs) are not beneficial in treating CTS. For patients who are unresponsive to conservative treatment, and experience symptoms for at least ten months, especially if they are over 50 years old, may be considered for surgical treatment. While surgical treatment has better outcomes than splinting, it is not known if it leads to better recovery when compared to corticosteroidal injections. Illes, J. D., and Johnson, T. L., Jr. (2013) Chiropractic management of a patient with ulnar nerve compression symptoms: a case report, J Chiropr Med 12, 66-73. Kuzma, S. A., Doberstein, S. T., and Rushlow, D. R. (2013) Postfixed brachial plexus radiculopathy due to thoracic disc herniation in a collegiate wrestler: a case report, J Athl Train 48, 710-715. Neal, S., and Fields, K. B. (2010) Peripheral nerve entrapment and injury in the upper extremity, Am Fam Physician 81, 147-155. NIH. (2014) Peripheral Neuropathy Fact Sheet. Thatte, M. R., and Mansukhani, K. A. (2011) Compressive neuropathy in the upper limb, Indian J Plast Surg 44, 283-297.